The very first large-scale industrial steam network at the Port of Antwerp, ECLUSE, is operational. On 15th March 2019, in the presence of around 200 invited guests, Flemish ministers Philippe Muyters and Lydia Peeters started the supply of steam over the network with a symbolic press of a button. ECLUSE will supply steam generated during waste incineration to five chemical companies at the port. That means these companies no longer have to generate the steam they need for their production processes in their own steam boilers, which will reduce CO2 emissions by as much as 100,000 tonnes a year. 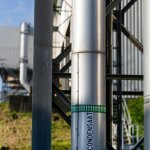 The project will also supply at least five percent of all the green heat produced in Flanders. ECLUSE will therefore make a significant contribution to the achievement of Flemish climate targets. The steam is transported at a constant pressure of around 40 bar and a temperature of approximately 400°C. A condensate pipe constructed by Fluvius carries the hot water back to Indaver and SLECO, where it is reused. On its way back it is first used to heat the offices of DP World. The complete pipe network is around 5 kilometres in length, the majority of which (+/- 4 km) is above ground. Having won the Sustainability Award in 2016, the Belgian Energy and Environment Award in 2017 and the CEWEP Integration Award in 2018, ECLUSE had already garnered considerable national and international recognition even before it had supplied the first steam.